Eureka Springs third annual ESPAfest saluted 17 winners recently. 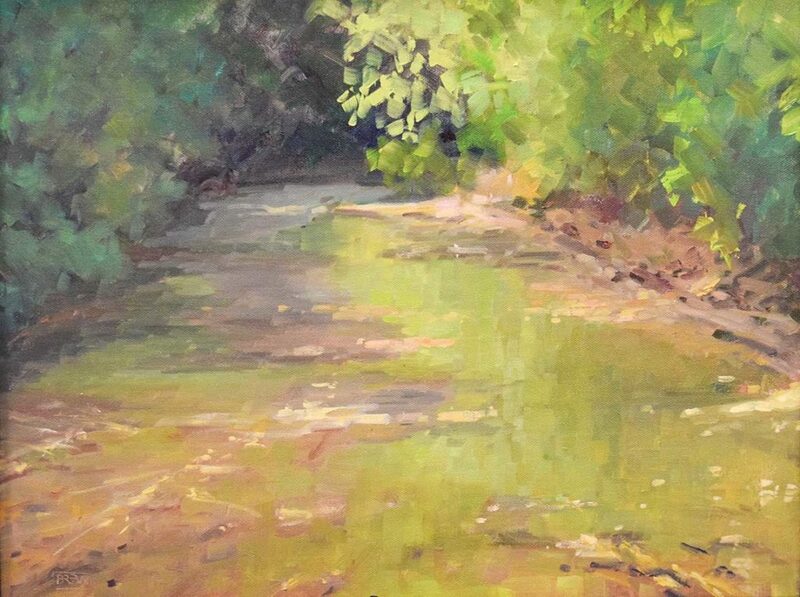 See who, in this overview of this plein air event. The Third Annual Eureka Springs Plein Air Festival, ESPAfest, held May 21–24, celebrated both spring in the Ozarks and the sweet springs of Eureka. Eureka Springs is an especially scenic locale for plein air painting. The daily paint-out locations of the ESNA Railway, the springs, and historic architecture were a treasure trove of subject matter for participating artists! Artists were treated to Ozark hospitality by Pat Fitzsimmons, owner of All Seasons Properties, who provided a breakfast buffet for hungry plein air artists who were up with the chickens each day! Three judges juried the event: Ann Powers, a signature member of the American Impressionist Society and the Artists of Northwest Arkansas, in addition to being a member of the Women Artists of the West and the Southeast; Dawn Ward, Ph.D. in Art Education from New York University, and present department head and professor of art at Arkansas Tech University; and Shannon Mitchell, accredited member of the International Society of Appraisers, affiliated with the Arkansas Committee, National Museum of Women in the Arts, Board Member of the Arkansas Arts Center, and Crystal Bridges Museum of American Art. The big winner of the event was noted watercolorist Richard Stephens, awarded Best of Show, winner of the Quick Draw event, and of the People’s Choice Award, all on May 24 for his architectural piece, “Historic Museum”! For Best of Show Richard received a quarter-page ad in PleinAir Magazine, and in addition, for the Quick Draw event, cash prizes of $600. Other winners were Terry Shoffner, First Prize for his watercolor “World War I Soldier”; John Willer, Second Prize, “On Spring Street”; and Tim Breaux, Third Prize, “Leatherwood.” All recipients received a subscription award from PleinAir Magazine in addition to cash prizes. $1,000 Purchase Prizes were awarded to Terry Shoffner, for his watercolor painting “Gazebo,” and to Tim Breaux, for his oil painting “Owen and Spring.” The sponsor of Terry Shoffner’s painting generously donated it to ESPAfest founder, the Eureka Springs School of the Arts, to be a Featured Art Auction Item at their fall fundraiser, the Mad Hatter Ball. Attendees commented that this exhibit consisted of the best plein air art they had seen ever at ESPAfest! The crowd went home excited about the prospects for next year’s event. Previous articleWhere in the World Is Plein Air?